Get to know your garden: Some important things that make the FPCG so special. 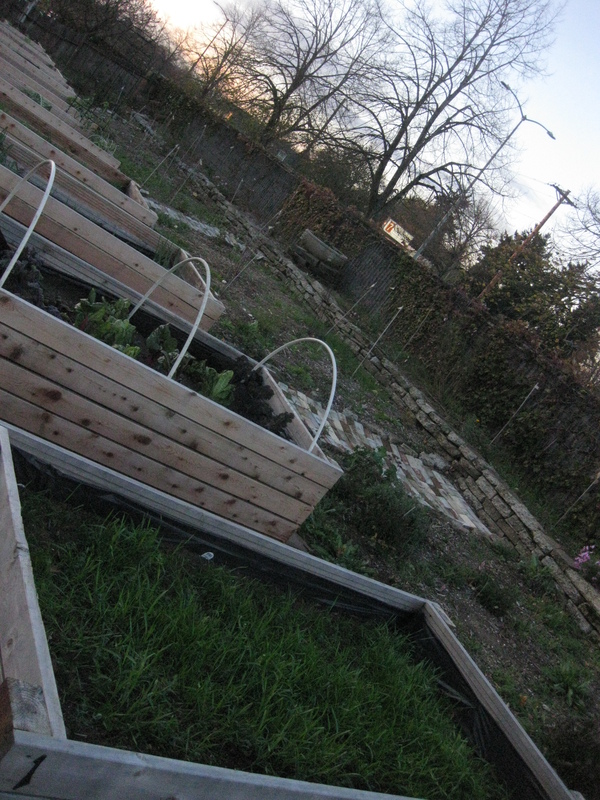 1) The garden is sitting on top of an asphalt lot. We believe there are gas tanks below the pavement from a gas station that was on this site in the 1950’s. 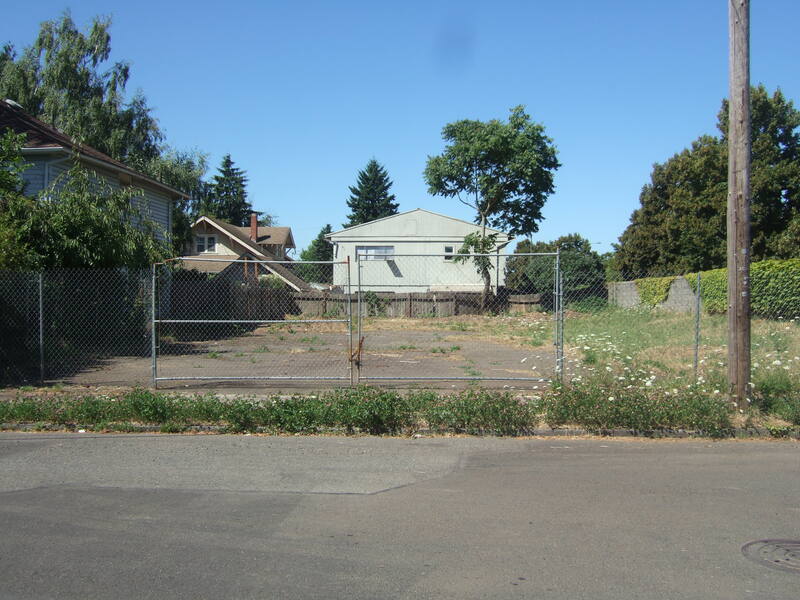 ODOT owns the property and is allowing the neighborhood association to use it indefinitely. ODOT purchased it in the 1980’s when the idea of widening Powell was on the table (The Mt. Hood Freeway). When that fell through, they had no use for the property. They currently have no plans to sell or use the site. Our agreement with ODOT stipulates no de-paving, no digging down into the original earth on the site or planting food directly in that soil, no planting trees and no permanent structures. 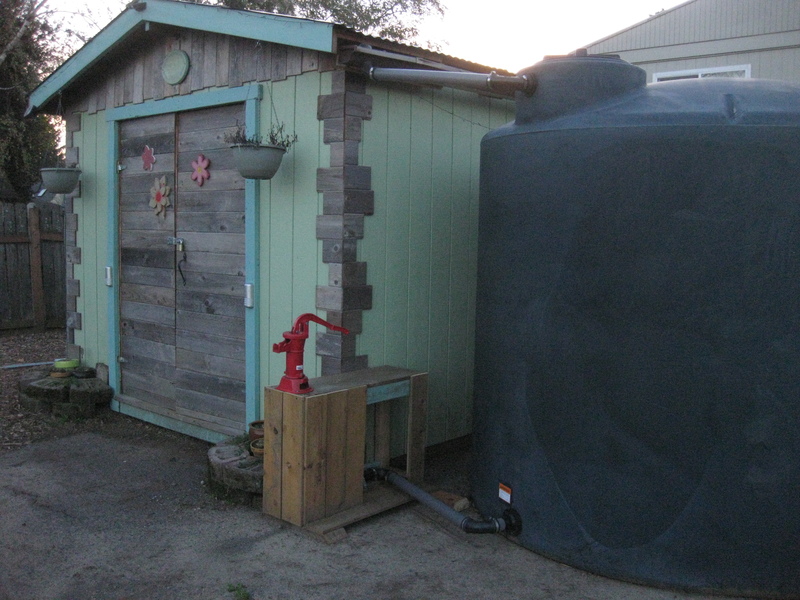 2) All of our water is rain collected on site in cisterns. 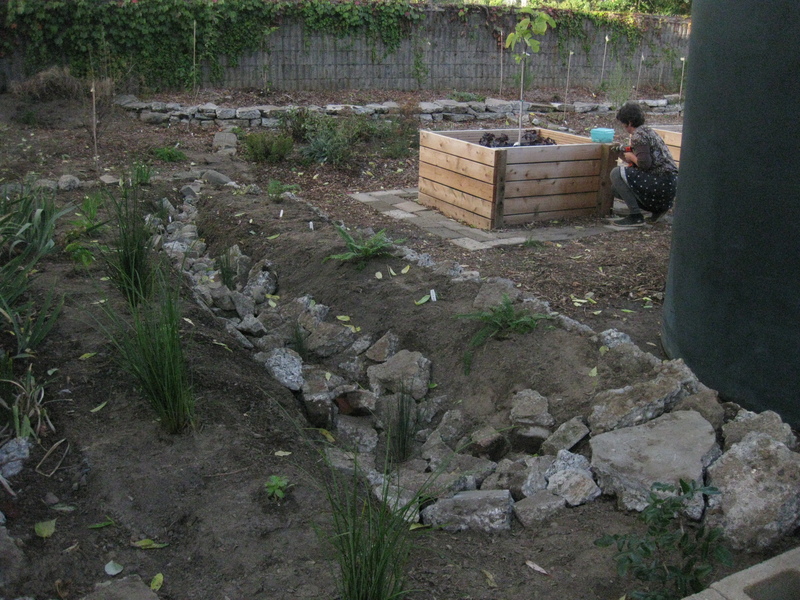 We do not have running water but we are collecting enough to support a very water conservative garden. Water is hand pumped and transported in buckets. 3) We do not have electricity on site. Our lighting is solar and we borrow power from our lovely neighbors on very special occasions. 4) We do not have trash or yard debris service. We try to take yard debris and garbage to our home cans when we are able. When the yard debris builds up, we load up a truck and take it to the waste transfer station. 5) There are currently 9 beds available to rent. By mid summer we will have 10-12 more beds built but we will not rent them until we have the second cistern full of water. We need to be sure we are not planting crops that we do not have the water to support. 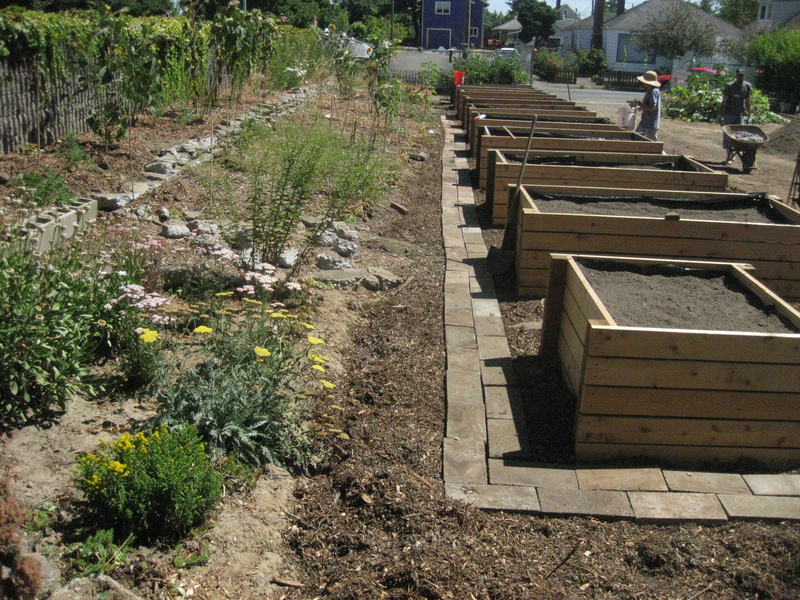 6) The garden was started by Vicki Wilson and John Larsen, two neighbors who wanted to spend some of their time and particular talents to improve their neighborhood. They first approached ODOT in June of 2011 and were given access and a permit to use the lot in April of 2013. 7) The garden is funded by small grants that were written by Vicki on behalf of the Foster Powell Neighborhood Association. 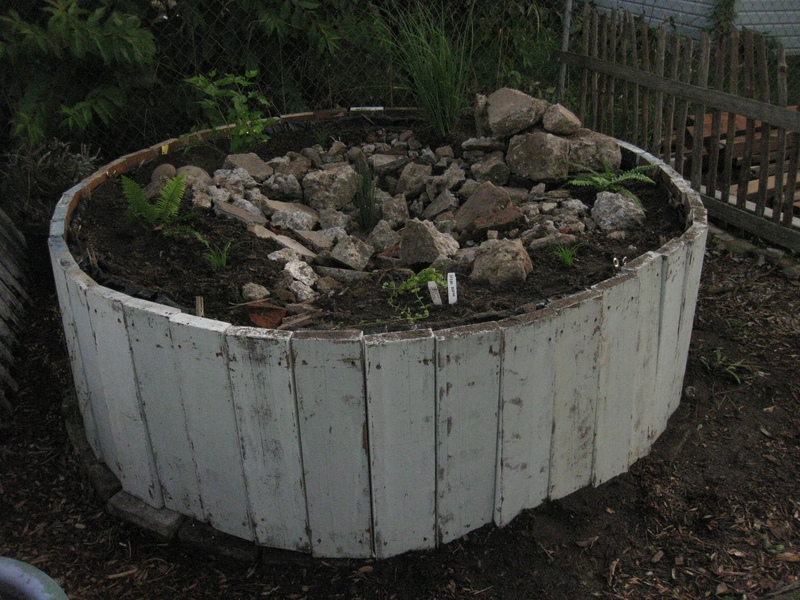 The garden has received 2 grants from EMSWCD ($1500 each) for native plants and the cistern and shed, two anonymous cash donations (total of $1700). We have raised about $1000 on site with various fundraisers. 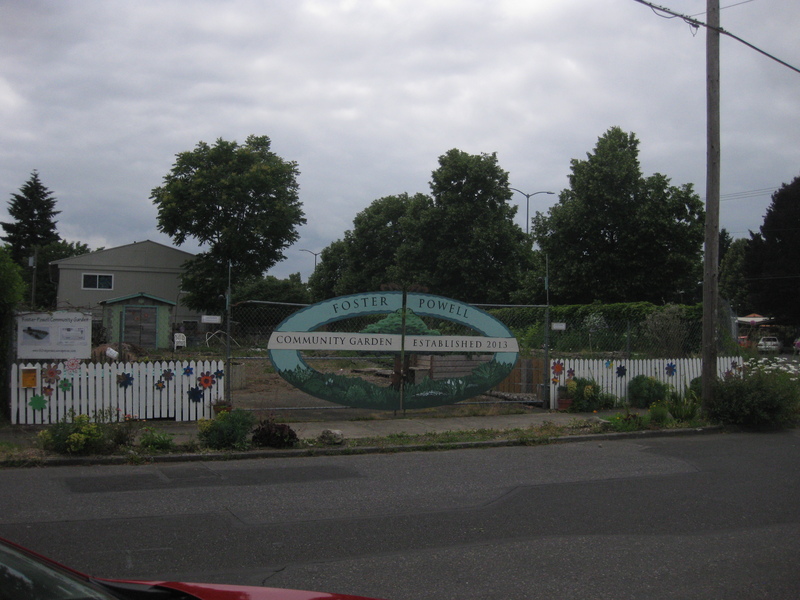 We got a mini-grant from the city of Portland CWSP program for $500 to spend on native plants at Bosky-Dell natives. Dennis 7 Dees has donated over $1000 in plants and $1000 cash. We now have a $2500 grant from Southeast Uplift’s Neighborhood Small Grants program which should get us very close to finished with the building of beds, cisterns and meeting areas. The Foster Powell Neighborhood Association provides $200 of their yearly budget to help with communications and neighbors have donated all of the tools, lots of dirt and other amenities. After this summer, the garden should run on the plot rental fees, donations and annual fundraising profits. This is fantastic, and I am so happy for your community!! I wish we had more communal spirit on the East coast. Awesome… this is 2 blocks from my house! I want to be involved. Much has happened since this initial post so please take it in that context. Some of our issues have been solved!